Home Domestic Football Transfers: Why Mateo Kovacic Is Necessary For Manchester City? Football Transfers: Why Mateo Kovacic Is Necessary For Manchester City? Manchester City will stroll into the new Premier League season, as the defending champions and will aim to retain their reputation of unparalleled consistency from the previous one. However, to build on their excellent past performances, Manchester City would have to get the most out of the transfer window before it closes on them. At present, Manchester City have been unsuccessful to sign substantial players in their squad. Their latest miss being the midfielder, Jorginho who preferred Chelsea over the current Premier League champions. With Fernandinho reaching the end of his career and Ilkay Gundogan not up to the mark, Manchester City are in dire need of a consistent midfielder. This is where the Madrid’s midfielder, Mateo Kovacic comes in the picture. Mateo Kovačić hails from Croatia and his strong capabilities of play making has allowed him to gain a significant spot in Real Madrid and his international team, Croatia. But, according to reports the midfielder is not getting enough play time and is likely to change clubs before the close of the upcoming transfer window. Mateo Kovacic will be next to leave. I honestly cant remember a player who left Real Madrid and didnt regret it within a year or two. You idiots can leave the club but you wont get a second chance at playing in biggest club in the world. Currently, Manchester City are the favorites to sign the Madrid midfielder, and in this article allsportspk presents you the top 3 reasons as to why Mateo Kovacic can fit in Manchester City’s mid-field. Mateo Kovacic is a prime example of a complete midfielder. Breaking play and recovering ball possession are only some of the many qualities that the Croatian possesses in his arsenal. As a vital play maker, dribbling the ball comes easy to him mainly because of his agility and precision in the field. Even Manchester City’s top midfielder, Fernandinho does not come close to Kovacic’s 1.7 dribbles per game. His dribbling skills play a significant role of opening up spaces in the midfield, which then allows the strikers to score more often. All things considered, what really makes Mateo Kovacic’s such a solid midfielder is his pass completion rate which goes to a staggering 93.8%. His ability also makes him eligible to take any of the three available positions in the midfield. This also means that if Manchester City hires the midfielder, then he can cover up for the likes of David Silva, Kevin De Buryne and even Fernandinho. 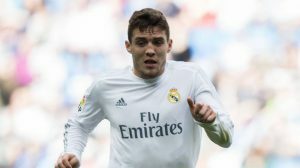 Chelsea have been long time admirers of Real Madrid midfielder Mateo Kovacic and have received some positive news that the player is ready to quite life at Real. What is the #2 reason? Move on to the next page to find out!